Need to Vent! 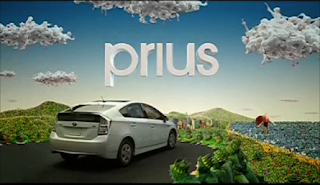 — Movie Reviews with a Twist: PRIUS -- Japanese for Pretentious? Years ago I started collecting airsick bags from Eastern European airlines. Why, I don't know. But those little retch receptacles from flagship carriers like Balkan Air (now Bulgaria Air), CSA (Czech Airlines), Malev (the national airline of Hungary), LOT Polish Airlines and Tarom (Romania's largest) sure come in handy whenever the latest round of Prius television commercials invade the Nowotny living room. And invade they do -- like the Battle of Guadalcanal, these sanctimonious, saccharine little Nippers come at you at least five times every hour. I'd rather be water boarded. From the absolutely vapid vocals of "Let The Love Flow" (originally a Bellamy Brothers tune sung here by some sparrow of a songstress named Petra Haden) to the Technicolor pap smear visualizations of imbecilic flower people adorned with costumes so cheezy no self-respecting first-grader would even consider wearing one to a school recital, this series of agonizingly annoying ads have to be the most nauseating, the most vainglorious, the most projectile-vomit inducing television commercials of the new millennium. It's pretentiousness personified, pandemic pabulum for the pious. 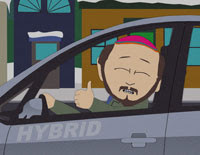 And speaking of pious, wasn't that the name of the hybrid in "Smug Alert" -- SOUTH PARK Episode 141? I think it was.